The 2007 Brazilian Grand Prix (formally the XXXVI Grande Prêmio do Brasil) was a Formula One motor race held at the Autódromo José Carlos Pace in São Paulo, Brazil on 21 October 2007. The 71-lap race was the seventeenth and final round of the 2007 Formula One season. The race was won by Ferrari driver Kimi Räikkönen, who consequently won the 2007 World Drivers' Championship. His teammate, Felipe Massa finished the race second, whilst McLaren driver Fernando Alonso completed the podium by finishing in third position. Lewis Hamilton, who had held a four-point advantage over Fernando Alonso, and a seven-point lead over Räikkönen, prior to the race was slowed by a gearbox problem early in the race. He recovered to finish seventh, losing the championship to Räikkönen by a single point; teammate Alonso also ended up finishing just a single point behind. This was also the last race for Ralf Schumacher. This was the first time since the 2003 Brazilian Grand Prix that Rubens Barrichello failed to finish his home Grand Prix. This was also the first double retirement for both Honda since the 2006 French Grand Prix and Renault since the 2006 Hungarian Grand Prix. This was Heikki Kovalainen's first retirement in his Formula One career. 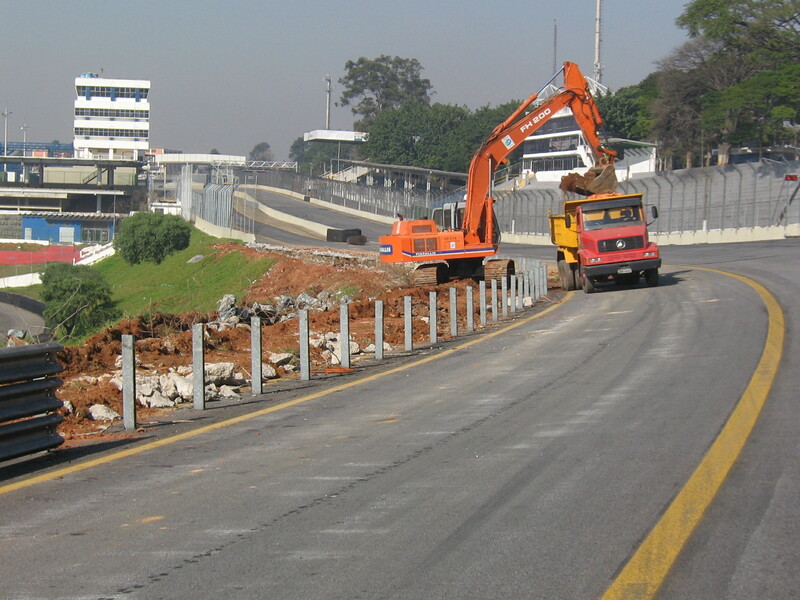 For the event, the largest-scale repairs in the last 35 years were carried out at the Autódromo José Carlos Pace, to fundamentally solve problems with the track surface. The existing asphalt was entirely replaced. At the same time, the pit lane entrance was enhanced to improve safety. To facilitate the work, the circuit was closed and no events were held in the five months immediately preceding the race. Alexander Wurz retired from Formula One at the end of the Chinese GP. He was replaced at Williams-Toyota by the Japanese driver Kazuki Nakajima, son of former F1 driver Satoru. As a result, three Japanese drivers were entered into a Grand Prix for the first time since the 1995 Japanese Grand Prix. Prior to the race, championship leader Lewis Hamilton (107 pts.) was 4 points ahead of second placed driver, Fernando Alonso (103 pts.). Kimi Räikkönen (100 pts.) was 7 points behind the leader. This was the first three-way title fight in the final race of the F1 season since the 1986 Australian Grand Prix, which saw Alain Prost become champion, ahead of Nigel Mansell and Nelson Piquet. In the Friday practice session, the Ferrari drivers topped the timesheet with Kimi Räikkönen leading the first practice in the wet session. In the second practice session, Lewis Hamilton led McLaren to a 1–2 finish, with the track improving over time. Stewards fined McLaren, Honda and Super Aguri €15,000 each for tyre rule infringement. Lewis Hamilton, Jenson Button and Takuma Sato used two sets of wet tyres, more than the one set permitted during the first practice. In addition, each driver had to surrender one set of wet tyres to avoid gaining any advantage. The first session of qualifying brought no surprises as the two Spykers of Adrian Sutil and Sakon Yamamoto plus the two Super Aguris of Takuma Sato and Anthony Davidson were eliminated along with Kazuki Nakajima, making his debut in the Williams, replacing the retiring Alexander Wurz. Heikki Kovalainen also went out in the Renault. Nico Rosberg made the top ten for Williams, and qualified on row 5 alongside Red Bull's David Coulthard. They lined up just behind Jarno Trulli in the Toyota and Robert Kubica's BMW Sauber. Kubica's teammate Nick Heidfeld was sixth, and Mark Webber did excellently in the second Red Bull to come 5th. It was a McLaren 2–4 with championship leader Lewis Hamilton ahead of Fernando Alonso. Their fellow championship contender Kimi Räikkönen qualified third, but it was his Ferrari teammate Felipe Massa who stole the show, taking the ninth pole position of his career at his home Grand Prix. Only 21 cars were aligned on the grid, because of problems on the Spyker of Adrian Sutil, who started the race from the pit lane. At the start, the Ferraris of Felipe Massa and Kimi Räikkönen were faster, with the Finn passing Lewis Hamilton on the outside. At the third corner, Fernando Alonso passed Hamilton on the inside and then, on the Reta Oposta, defended himself from the attack of the Briton by taking the inside line. Hamilton locked up his brakes and went off the track while trying to regain the position. He rejoined the race in 8th place, just behind Jarno Trulli's Toyota. Also in the first lap, Liuzzi lost his front wing and was forced to enter the pits for repairs. In the first corner on the second lap, Fisichella went off the track, and was hit on the back from Sakon Yamamoto while re-entering on the track. Rubens Barrichello jumped the start and was given a drive-through penalty for this. Hamilton was trying very hard to make up for the positions he lost: on lap 2 he passed Trulli and went into 7th, and 4 laps later he passed Nick Heidfeld to take the 6th place. Just minutes later, he suffered a gearbox problem: on the Reta Oposta, he failed to find gears and slowed down, to be passed by most cars on the track. After going slow for about 30 seconds, Hamilton managed to reset the computer of his car, and get it going again: he was in 18th place by then, and with the Ferraris pulling away he needed at the very least 7th place but more likely 5th place to clinch the World Championship. On the front no position was changed: by lap 15, the Ferraris were almost 12 seconds ahead of Alonso, third. By that lap, Hamilton climbed to 11th, having passed Barrichello, Ralf Schumacher, Anthony Davidson, Takuma Sato and Kazuki Nakajima, and having taken advantage from the retirement of Mark Webber, who was running in fifth position. After 20 laps, the front runners began stopping for the first time: the first was Robert Kubica, who went for 3 stops; on the same lap Massa entered the pits. Räikkönen pitted on lap 22, carrying a bit more fuel than his teammate, to try to overtake him after the second stop. Alonso, Trulli, Vettel and Hamilton pitted on lap 22, with the Spaniard keeping hards, while Hamilton switched his strategy to a 3-stopper (a rather risky strategy on the track which features the longest pit lane of the whole season): he carried less fuel than Alonso and switched to soft tyres. Heidfeld was the last to stop, pitting on lap 25. After the first round of pit stops, Massa was leading with 3.3 seconds on Räikkönen, followed by Alonso, 17 seconds behind. Hamilton was 13th, again behind Barrichello, 50 seconds behind Massa. On lap 32, Nakajima entered the pits for his first stop, but he ran wide while entering his stand, injuring two mechanics in the process. They were both brought away, but they suffered no serious injuries. On lap 34 Kubica, who was light on fuel, passed Alonso to take the third position, only to stop 5 laps later; he rejoined in seventh place. Hamilton made his second stop on lap 37, switching to hards again; on the same lap Heikki Kovalainen, who finished his first 16 consecutive races in Formula One, ended his race spinning on turn 3 and crashing into the barriers. This also meant that Kovalainen lost the once-in-a-lifetime opportunity of becoming the first driver to finish all of his races in his first season. On lap 43, the second round of pit stops began: the first to enter was David Coulthard from 8th, followed by Trulli (then 6th) a lap later. Meanwhile, Massa made an error and ran wide at the Descida do Lago, with Räikkönen closing on him. The Brazilian pitted on lap 50, followed by Alonso on lap 52 and Räikkönen on lap 53. The Finn set record lap times in the process, which meant he rejoined the race into the lead, 2 seconds ahead of Massa. At that point, Räikkönen was the virtual world champion; third was Kubica (who still had to stop a third time), fourth Alonso, then came Heidfeld, Nico Rosberg, Trulli, Hamilton (more than a minute behind Räikkönen), Coulthard and Nakajima. Hamilton pitted on lap 57, rejoining in 9th. On lap 59 Kubica pitted dropping to 6th; in the same lap Hamilton passed Coulthard to take the 8th position, setting the then fastest lap. On the final laps the positions were pretty much set: Räikkönen and Massa led with a comfortable margin on Alonso, and Hamilton was lapped. On lap 61 Rosberg tried to pass Heidfeld on the first corner: both ran a little wide (Rosberg passed Heidfeld), with Kubica passing both to take the 4th. On lap 70, Rosberg tried successfully a similar move, overtaking Kubica. Hamilton gained the 7th place when Trulli made a pit stop, but this wasn't enough, as he needed at least a 5th place to gain the title. At the chequered flag, Räikkönen was first, winning the race and the World Championship by one point, taking his first victory in Brazil, having been a runner-up on three consecutive occasions. He performed the seemingly impossible task of cutting Hamilton's 17 point advantage over him in 2 races. Massa was second in the other Ferrari, the fourth double (1–2 finish) of the year for the Italian team. Third, and last on the podium, was Alonso. The other drivers on points were Rosberg on 4th, Kubica on 5th, Heidfeld on 6th, Hamilton on 7th and Trulli on 8th. The race gained an average of nine million viewers in the United Kingdom on ITV1, which was the highest for Formula One in seven years. Viewer numbers peaked at 10.4 million in the last 15 minutes. After the race, the result had been thrown into doubt following an inquiry into the cars of BMW Sauber and Williams. Race stewards investigated alleged irregularities with the cars' fuel. The stewards decided not to penalize the teams based on a lack of conclusive evidence, but the McLaren team appealed against this ruling. The appeal was finally rejected by the FIA on 16 November 2007. Had the FIA accepted the appeal, although it would be unprecedented, the title could have been handed to Lewis Hamilton. Hamilton stated that he wouldn't have favored winning the championship by this means. On 17 October, Companhia Paulista de Trens Metropolitanos (CPTM) began to operate the new station of the Line C, Autódromo, near the circuit. The Line C had been extended to improve the access between the center of São Paulo and southern region of the Greater São Paulo including the circuit. As a result, 7,100 spectators used this new station on Sunday, 21 October alone, and 18,000 or more spectators in total from Friday to Sunday. In Spain, television broadcasters Telecinco and TV3 had a total average audience of 9.0 million viewers, with a market share of 77.8% in Asturias and 69.2% in Madrid. McLaren was disqualified from the Constructors' Championship. Bold text indicates the 2007 World Champions. ^ "Practice 1: Kimi heads Ferrari 1–2". ITV-F1. 19 October 2007. Archived from the original on 21 October 2007. Retrieved 20 October 2007. ^ "Practice 2: Hamilton shades Alonso". ITV-F1. 19 October 2007. Archived from the original on 21 October 2007. Retrieved 20 October 2007. ^ "Lewis escapes penalty over rule breach". ITV-F1. 19 October 2007. Archived from the original on 21 October 2007. Retrieved 20 October 2007. ^ "Rugby, F1 draw strong audiences". Digital Spy. 22 October 2007. Retrieved 22 October 2007. ^ "Hamilton race draws 10.4m viewers". BBC. 22 October 2007. Retrieved 22 October 2007. ^ "TV ratings hit seven-year high". ITV Sport. 22 October 2007. Archived from the original on 23 October 2007. Retrieved 22 October 2007. ^ "McLaren appeal rejected". itv-f1.com. 16 November 2007. Archived from the original on 18 November 2007. Retrieved 20 November 2007. ^ "ESTAÇÃO AUTÓDROMO RECEBE MAIS DE 7.000 USUÁRIOS NESTE DOMINGO" (in Portuguese). CPTM – Companhia Paulista de Trens Metropolitanos. 22 October 2007. Archived from the original on 6 July 2011. Retrieved 23 October 2007. ^ "FORMULA 1 Grande Prêmio do Brasil 2007 - Qualifying". Formula1.com. Formula One Group. 20 October 2007. Archived from the original on 31 October 2013. Retrieved 27 December 2015. ^ "FORMULA 1 Grande Prêmio do Brasil 2007 - Race". Formula1.com. Formula One Group. 21 October 2007. Archived from the original on 28 December 2014. Retrieved 27 December 2015. ^ a b "Brazil 2007 - Championship • STATS F1". www.statsf1.com. Retrieved 13 March 2019. 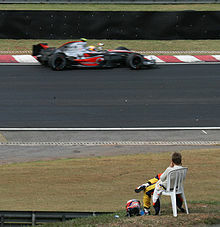 Wikimedia Commons has media related to 2007 Brazilian Grand Prix.